University of Florida News - Gene therapy for blindness clears hurdle in mice: "University of Florida researchers have used an experimental therapy in mice to shut down a gene that plays a crucial role in a leading cause of inherited blindness. The technique, detailed in an upcoming issue of Vision Research, involves injecting the eye with a bit of genetic material called interfering RNA, which helps disable the gene. Normally the gene is essential for healthy eyesight, but mutated versions of it are passed from generation to generation in some families and can lead to blindness. Disabling the gene is a step toward developing a gene therapy to treat people with retinitis pigmentosa, an inherited disease that attacks the light-sensing cells in the eye. It affects about one in 60,000 people, with an estimated 1.5 million people afflicted worldwide. “One of the causes of the disease is mutated gene expression,” said Marina Gorbatyuk, an assistant professor of molecular genetics and microbiology in the UF College of Medicine. “We work with rhodopsin, which is the main retinal protein. Without it, or if it is mutated, people simply won’t see.”"
BBC NEWS | Science/Nature | Trials for 'bionic' eye implants: "US researchers have been given the go-ahead to implant the prototype device in 50 to 75 patients. The Argus II system uses a spectacle-mounted camera to feed visual information to electrodes in the eye. 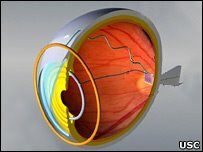 Patients who tested less-advanced versions of the retinal implant were able to see light, shapes and movement. 'What we are trying to do is take real-time images from a camera and convert them into tiny electrical pulses that would jump-start the otherwise blind eye and allow patients to see,' said Professor Mark Humayun, from the University of Southern California." MIT Media Lab: h2.0 -New Minds, New Bodies, New Identities: "The program will focus on the Media Lab's sweeping new research initiatives for augmenting mental and physical capability to vastly improve the quality of human life. Presenters will explore how today's—and tomorrow's—advances will seamlessly interact with humans, giving us a glimpse into a future where all humans will integrate with technology to heighten our cognition, emotional acuity, perception, and physical capabilities." 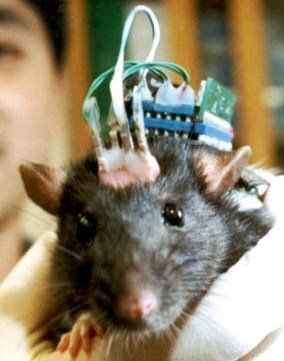 WIRED Blogs: Danger Room: "Military Cyborg Menagerie"